The Yellow Oriole is a medium-sized, yellow/olive bird with dark streaks on its wings, red bill and eyes. 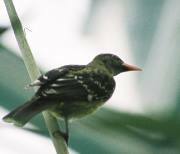 It is common in tropical rainforest along large rivers in Australia and its pleasant liquid call is a near constant sound along the Daintree River and around the Cairns Botanical Gardens However, it frequents the top of the canopy and can be a difficult bird to see. One of the best places to see them is around the pool at the Daintree Eco Lodge. These Orioles are unrelated to the American Orioles, and are usually referred to as the 'Old World Orioles'.